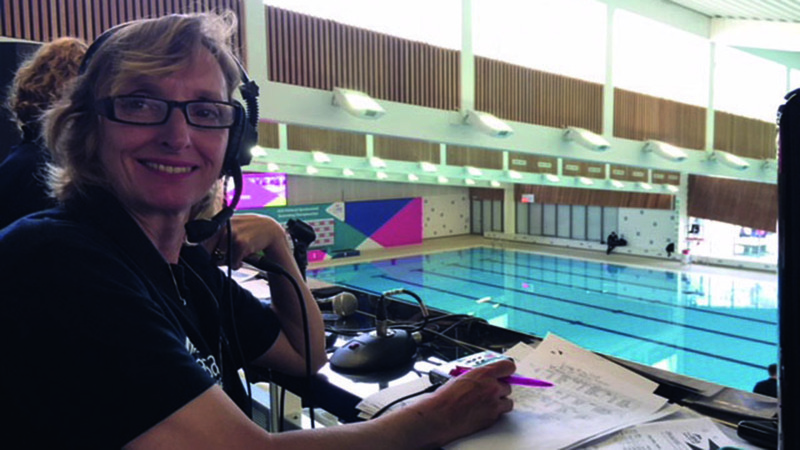 To celebrate Volunteers’ Week from 1-7 June, here is the full story from the “accidental announcer”, Helen Seamer, who once volunteered to help out at her daughter’s synchronised swimming club and now her voice is heard at all the major competitions. I recently received an email from Glasgow 2018 inviting me to take on a volunteer role which, some years ago, I would never have imagined having the confidence to do. Looking back, I am amazed at how my volunteering journey has evolved. I have always believed there is a sport for everyone and that it is just a matter of trying them out until you find one that you love. With this in mind, some 18 years ago, I was on the hunt for a sport for my water-loving daughter. She loved being underwater so I took her to a trial session at the local synchro club. With one lesson she was hooked. Signing up meant committing to a training schedule, which gave me plenty of time to watch from the side and be amazed by the agility and lung capacity of the swimmers as they learned their craft. I must have spent too long on the side for I was soon asked to help out. With a background in the diplomatic service, I was probably the least likely or qualified person to take on a coaching role. But the head coach said ‘don’t worry, we can teach you!’ I quickly learned that running the club was no mean feat and its very existence depended on the help freely given by the coaches, many of the mums and a few dads! And so began a journey into the unknown world of synchronised swimming. Starting as an extra pair of eyes and shadowing the senior coaches, with lots of teacher training sessions I slowly came to grips with sculling and eggbeating and I found that I enjoyed working with the team and seeing the swimmers progress. By attending competitions and helping out as team manager, I learned what goes on behind the scenes so that, later, I was able to take on the role of county manager, with the responsibility of organising the county competition. This was where I really began to appreciate the unstinting willingness of everyone connected in synchro to help out. An army of volunteers with a wide variety of skills are needed to run a successful competition. Judging is complicated and not for everyone, clerking needs a cool head and you almost need a degree in pure maths to be a scorer. But everyone can do something and, in my case, I took on the announcing role. At county level, I thought I had got off lightly! When London 2012 came along, I was delighted to see that my fellow Games Makers were many of the people I knew from all around the country who volunteered in synchro and we all had a once-in-a-lifetime experience helping out behind the scenes of the Olympics. My role there was with the International Federation Services Team looking after the technical committee members from FINA. It was amazing to play a part in putting on the greatest show on earth. During the Games, my club’s head coach had a chance encounter with synchro’s executive director who said that synchro needed a new announcer. ‘I know one,’ she said. So, from county announcer, I stepped up to nationals’ announcer and into a whole new world of sports presentation. I must have got the hang of it as I was asked to do the role at the 2016 European Championships in London. To my delight, this will be reprised in Glasgow this summer. I am so happy that all those years ago, whilst not knowing what I was letting myself in for, I said yes to volunteering and to working with a host of unsung heroes who give so much to the sport. It has given me wonderful opportunities and the confidence to take on things that I never imagined I might do. My advice to anyone thinking of helping out is have a go. You never know where it might lead. Fancy volunteering as a synchronised swimming coach? Find out more information here. This article first appeared in the Swimming Times May-Jun 2018 issue. To read more articles like this, head to the Swimming Times magazine subscription page.